Like so many others when war was declared, I applied at once to the St. John Ambulance, to which I belonged, to know if there was any possibility of their making use of me, my only recommendation being three months' training in the London Hospital. I was told that only trained nurses were wanted, and so gave up hope, but three days later the British Red Cross got an appeal for forty nurses to be sent out to Belgium; five St. John Ambulance nurses (V.A.D. 's later on) were being sent, and I was asked if I would go. I naturally accepted with alacrity, and August 14th found us in Brussels. Most of us were taken to the Hotel Metropole, where we were to await orders. As there was a big battle expected any day, we should all be badly wanted. Next day some of the nurses were sent to hospitals outside Brussels, and others, including M., my cousin (who was a fully trained nurse), and myself, were given posts in the Royal Palace, which posts, however, we never filled, as the next thing we heard was that the Germans were outside the gate of Brussels, and all the allied wounded were to be evacuated to Antwerp. We were then given the option of returning to England at once; some returned, but we, M. and I amongst others, elected to remain, as we were told we were wanted outside Brussels. On our return from a trip out beyond the gates we heard we had been applied for, M. and I, to go to Charleroi to join a matron and two nurses who had gone there a few days before. We were given ten minutes to get ready, and were very glad to leave the hotel (which by this time was full of German officers), and to feel we were at last wanted. As there had been no fighting in Brussels, there was very little need for nurses. We were raced off in a car by the Belgian Red Cross, and were dumped down late in the evening at one of the hospitals in Charleroi; but could find no trace of our compatriots, though we searched all the hospitals, nor could we get any news of them. The town was still burning, and most of the houses were shelled, and had gaping windows and large shell holes, and the streets were littered with broken glass and bits of furniture; but every house flew a white flag of some sort, which had been no help to them, as the Germans said they had been fired on. It was now getting very late, and we were told nothing could be done till the morning, so we gratefully accepted the offer of one bed from a kindly Belgian. We spent a sleepless night. The guns sounded so close and shook the house, and it was with great relief we saw the day break, and we started once more on our search, this time with more success, as we heard they were at a hospital at Marcinelle, five miles out of Charleroi. 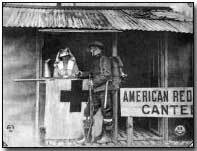 We trudged there, leaving our luggage to follow, and found the matron and nurses in a semi-equipped hospital, desperately busy, and worn out with all the wounded who had been brought in a few days before from the battlefields nearby. The German wounded, slight cases and dying, had all been evacuated the day before we arrived, and we took this as a good sign that the Allies were near, especially as we heard the guns so close, but this was not the case, as the fighting was in reality getting further away. We had plenty of work, though no fresh wounded. The hospital was originally intended for a civil hospital, but before it was finished the War broke out, and it had to be hastily equipped as a front line hospital, and in consequence was very badly supplied, and though we found beautiful electric appliances none of them were in working order, and all water had to be heated on a small stove, and many beds were without mattresses. Our matron very soon left us to look up some other nurses in Brussels. She took the offer of a seat in a car going there, and that was the last we saw of her. M. had been left in charge. 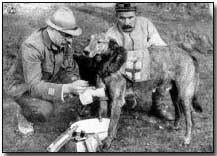 The wounded were all French, and we found them extremely nice to look after. 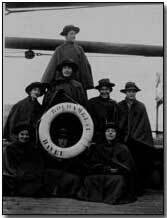 They were most grateful for all we did, and were much amused at the amount of cleaning and washing required by the English nurses, those of them that were well enough. We had many exciting incidents and thrilling moments, especially when the German guards came round, as we never knew what they might be coming for. It was sometimes a search for a deserter, or to see that none of our patients were escaping. We never knew that it might not be to march us off, as rumour had it that we should be sent to Germany. Life was one continual series of shocks; strange noises made us think we were being shelled; the electric light going out one night made us vividly imagine we were going to be blown up. Many of these scares ended in laughter, the Frenchmen ragging us for our crises de nerfs, but they did not quite like it themselves, lying helpless in bed. We had a very busy time, but our patients were being gradually taken to concentration hospitals in Charleroi or to Germany as soon as they were fit to move, and we realized that our work before long would come to an end, and we began to wonder what was to become of us. We had had no news for a long time, all means of communication having been stopped. We had no idea what had happened anywhere, or what the English nurses in and around Brussels were doing, so thought we must try and get news somehow from Brussels. We found a Belgian who had means of going there, and we asked him to put our case before the American Minister, who, we knew, had been asked to look after British interests. We wanted some money advanced on our cheques, as we had practically nothing left, and for help to return to Brussels or England. The only answer we got to our appeal from the U.S.A. Legation was that we were on no account to go to Brussels; that they could give us no money, and that we were to ask the German Commandant in Charleroi to give us a pass to England or Maastricht via Germany. This answer completely nonplussed us, as we did not want to advertise the fact that we were four English nurses alone in a hospital inside the German lines, especially as we had heard a rumour that some of the nurses who had been in and around Brussels, and who were supposed to have been sent to England by the Germans, were last heard of in Russia. All these reports made us very unwilling to apply to the German Commandant for passes; so we decided to wait till our last wounded had been taken, hoping something might turn up. Food was getting beautifully less and less, meat very occasional, and we lived for the most part on beans and potatoes and soup made of the same, flavoured with many fryings in the frying-pan. This, by the way, got me into severe trouble with the old cook, Mme. Gustave, because when I, on night duty, had to warm up our scanty meal, washed and scoured the frying-pan, I was told next day that I had completely ruined the soup and beans for ever, as we now would never get enough meat or onions to bring back the flavour of so many fryings. I never heard the end of that flavouring. The bread was black and sometimes so hard we couldn't eat it, and other times so doughy that when thrown at the wall it stuck. We very, very rarely, as a great treat, had a mouthful of white bread given us by some kindly Belgians. By now our last man had been taken from us, and we felt that something must be done at once, so, much against our feelings, we bearded the German Commandant, who kept us waiting for a very long time, and we heard the orderly we had spoken to first, and who spoke English very well, telling the Commandant that we wanted passes to England via Germany or Maastricht. This he flatly refused, saying we must remain in Charleroi; nothing would move him, and so we returned crestfallen to Marcinelle. Having now no work to do, we spent our days making definite plans to escape. Our only anxiety was to get away quickly before the Germans could get any inklings of our efforts. We had been cheerfully assured by the Belgians that, if they did get wind of them, we should undoubtedly be shot. This we were more than ready to believe, and many a time had visions of being lined up against the wall. We managed at last to get a small sum of money lent us by our Belgian friends, and after many hours of talking we I finally came to the conclusion that our best plan would be to accept the offer of a Belgian mine-owner, who offered us the use of his coal miners' ambulance to take us part of the way. We were advised to leave in the dead of night, and we arranged to dine with our friends the following night, telling the concierge at the hospital, whom we did not trust, that we should be spending the night with them. This we did, taking only a string bag with toothbrushes, etc., and dressed in mufti, with our Red Cross brassards sewn in the bottom of our skirts. After a marvellous dinner to speed us on our way, the ambulance picked us up at 2 a.m. Two Belgian women accompanied us, as it was thought safer to go in a party. We had many nerve-racking moments when we met sentries and guards, especially crossing the bridge out of Charleroi, the driver explaining that we were a miners' ambulance; after a few words he passed us on. In the early morning we arrived at Fleurus, where we took the tram to Namur, and where we arrived in a snowstorm, and then on to Liege, partly trams, partly trudging. These last two towns, as well as villages along the route, were in ruins. We had palpitating moments when the sentries on the trains asked for our papers; all we had were "laisser-passer" as far as Liege, which our friends had somehow managed to wangle out of the Germans, stating we were Belgians going to see sick relations. These we showed, but fortunately we struck men who could not read French, but we murmured something which seemed to satisfy them. Before starting on our journey we had agreed that M. and I would do the talking, as the other two nurses did not speak French, and we naturally did not want it known we were English. We spent the night at Liege, a room having been found for us, starting off the next morning early, feeling we had the most difficult part of the journey before us with the frontier to pass. We were thrust into a market cart going to Maastricht with vegetables. All this had been arranged for us by our Marcinelle friends, who had found out that Liege market-women carried on a trade taking refugees over the border. Just before arriving at the frontier the owner of the cart said she could only risk three across, so that the other three must manage as best they could. A Belgian, one nurse and myself got out, and the cart drove on with the others. We walked a bit, then started to cross a field, and had just crawled under some barbed wire, and were beginning to feel we had escaped, as we thought it was the frontier, when, to our horror a loud voice called on us to halt, and we looked round and found a sentry covering us with his rifle. So we turned back, as we knew that if any of us tried to run for it one of us would, at least, be shot. The sentry then asked for our papers. This was a blow, as they only allowed us to Liege, and here we were well on the way to Maastricht. However, the man seemed only to worry about the German stamp, and, seeing that, told us we must go back to the road and in through the proper douane. This we knew we could never do. There wasn't a hope of our being allowed through, but we walked in that direction, and further on tried again to cross, where we came on another sentry. This time we did not try to pass him, but came back again to the road, making up our minds as we walked on to bluff the next one if we met with one. We did meet with one and he was busy with a young Belgian who wanted to cross, so we hurriedly pushed our German stamp out for him to see and pressed some money into his hand and walked away as unconcernedly as we could, and again crawled under the barbed wire, expecting any moment that we might be shot at. However, this time we were safely across, but to our horror another sentry appeared, only he turned out to be a Dutchman who laughed at our scared faces. By this time we were almost without feeling one way or another: the strain since leaving Marcinelle had been so great, as we were always terrified that our escape had been discovered and that we might be arrested at any moment. We stumbled on to the market place at Maastricht, where we found the others, who had got safely over. We had no sooner found rooms in a hotel when a message was brought us from a man who wished to see us, and it turned out that he was an Englishman over there on military business, and wanted some very important papers taken to a certain Government office in London. We were not too keen about it, but eventually agreed to take them. The next day we took train to Flushing, and after some difficulty, owing to our having no papers on us, and only our Red Cross brassards stamped with the German stamps in Brussels, we got passages across to Folkestone, where the authorities found it difficult to believe our story, and where we were detained till they had made enquiries at the British Red Cross headquarters in London. So this was the last of our troubles, and we were thankful to be back once more in England. Our reward came in the shape of the Mons Star. Miss Esmee Sartorius, after returning from Belgium, continued nursing for the Red Cross in England until 1918, when she was sent to a British Red Cross Hospital for Italians on Lake Garda.